Weather Headache: Is There Such a Thing? If your head is throbbing and the weather outside is stormy, or freezing, or intensely hot, you could have a weather headache. Thus far, research on such a phenomenon is light, but for many, there's most definitely a connection. Weather headache: Is it a thing? Participants in a National Headache Foundation survey were asked to rank 16 potential migraine triggers. Some 73 percent said that "weather or barometric pressure changes" triggered their headaches; another 38 percent cited "extreme heat or cold." If you think you’re imagining things when a certain type of weather seems to trigger a headache, think again. In fact, many people report that they suffer from a weather headache if a storm is approaching. They also report that storms aren’t the only meteorological phenomenon that can result in a weather headache. Even so, scientific research has not yet come up with evidence that proves there’s a link between weather and headaches. This is partly because people who regularly get headaches typically have numerous triggers that set their heads pounding. So it’s possible that other physical, emotional, or environmental factors might be triggering headaches. If weather is indeed the culprit, it may be in conjunction with other triggers—for example, the combination of bad weather while you’re eating chocolate, or bad weather while you’re drinking a glass of wine. Weather Headache or Barometric Pressure Headache? People who suffer from migraines often get what they perceive to be a weather headache between—or alongside—migraine attacks. Studies suggest that about one-third of migraine sufferers believe that some of their migraines are actually weather headaches. Migraine sufferers also think that at least two-thirds of their headaches might be due to weather disturbances. Changes in the temperature and humidity levels are most likely to trigger a weather headache in migraine sufferers, according to research. It’s possible that barometric pressure—which is the “weight” of the air surrounding you—may play a role, and that your weather headache may really be a barometric pressure headache. Scientists think it is possible that changes in barometric pressure may result in a painful pressure differential between your sinuses (air-filled cavities between your eyebrows and across the bridge of your nose and the tops of your cheekbones). They also theorize that barometric pressure changes cause imbalances in important brain chemicals (such as serotonin) and dilate blood vessels, altering blood flow to the brain. In one study, temperature and barometric pressure increases over a period of 24 days resulted in more migraine suffers having to attend the Emergency Department over the next two to three days. Barometric pressure falls when low-pressure weather systems move in, and also as your altitude increases (for example, if you hike up a mountain, or take a vacation in a city that is further above sea level than you are used to). 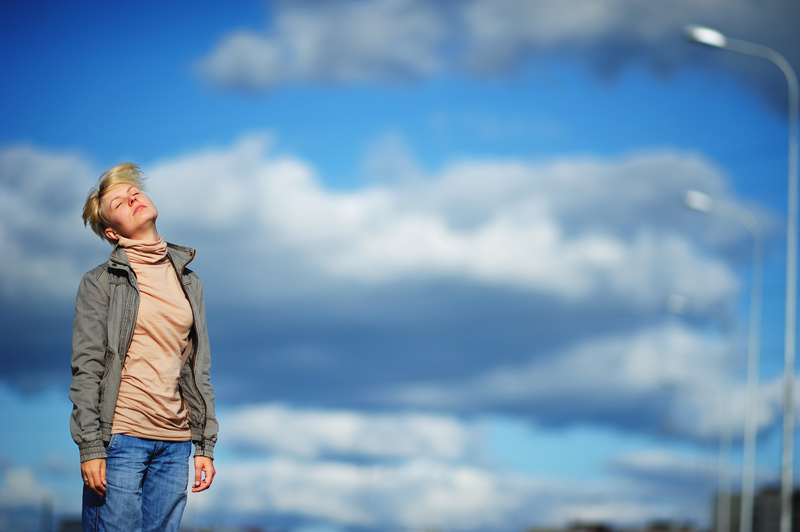 Barometric pressure also falls in humid weather, when the air becomes moister. If you have arthritis and barometric pressure is a factor in your headaches, you may be vulnerable to more than a weather headache. People with arthritis report that their joints ache more during periods of low barometric pressure. People who often get a weather headache believe their ailments help them predict future weather conditions: Their headaches serves as a warning for impending storms. In fact, some experts contend that weather headaches served as a sort of severe weather alert for early mankind—a warning to seek shelter before the storm hit. Is Sunlight Causing Your Weather Headache? People who get migraines also may be susceptible to a weather headache caused by bright sunlight. It is possible this type of weather headache may occur because migraine sufferers simply have a lower tolerance threshold for bright light both during and between migraine attacks. Keep in mind that spending long periods of time outdoors in the summer sun can result in dehydration. So if you don’t replace the fluids you lose through perspiration, your weather headache could actually be a dehydration headache. Drinking plenty of water, of course, will help avert this type of headache. Tension headaches also may result from being outside with the sun on your head. So seek the shade as often as you can. It isn’t just humidity that’s linked to weather headaches—dry, windy weather also can be a problem. A Canadian study found that Chinook winds blowing down the east side of the Rocky Mountains across Alberta caused migraine attacks, though it isn’t clear why the winds were a trigger. For other people, it may be particles carried in the wind that causes their weather headache; if they suffer from hay fever, it could be that the wind is exposing them to more pollen than usual. It’s difficult to avoid a weather headache if your weather triggers are out in full force, but you may be able to mitigate the discomfort by trying to avoid other headache triggers that could combine with the weather. If you know that bright sunshine may cause a migraine attack, try not to go out during peak sunlight hours. If you do have to go out, be sure to wear polarized sunglasses (which are proven to be better than traditional sunglasses when it comes to deflecting sunlight) and a sunhat. Keep windows closed if you’re at risk for a weather headache because the wind will cause pollen to circulate. As to treatment, painkillers and other headache remedies should help you cope with a weather headache once it strikes. Click here to read our post “Headache Cures: 9 Strategies to Ease the Pain.” See also the National Headache Foundation’s website at headaches.org. arthritis, brain, brain chemicals, chocolate, dehydration, dehydration headache, hay fever, headache cures, headache remedies, headaches, long periods, migraine, migraines, pain, pressure headache, report, serotonin, tension headaches, weather, weather headache, wine. I can definitely attest to the association of low barometric pressure on migraine headaches. While the prime cause of my migraines were hormonal, they were more frequent and intense whenever the barometric pressure was dropping due to weather changes. For two years my job assignment called for me to alternate living in two locations, one near the coast with high humidity and frequent barometric changes and the other in a drier climate 2000 miles away and with less fluctuating barometer readings. When I first noticed the difference I thought it might be related to stress or something else. I had heard from a friend about the potential impact of barometric pressure so I began to keep a daily journal of all the potential triggers. To my surprise, I soon realized I could tell what the BP was by the intensity of my headaches! As I mentioned, my primary trigger was hormonal and once I went through menapause my migraines went away, just as my doctor predicted. I still get a headache when the pressure is significantly down but nothing like the migraines of the past. I thought you might be interested in this article on https://universityhealthnews.com: Weather Headache: Is There Such a Thing?